It was late. I was tired. But I had to pull my camera out of the bottom of my bag and capture this. Beautiful! Love the color and composition. Thank you! The color slowly changes, I’d finally get the color I wanted, and someone would walk right in front of me. So, it took a little while. Wow!! Really love the perspective on this one as well as the fabulous color! oh, wow – and thank goodness for that! 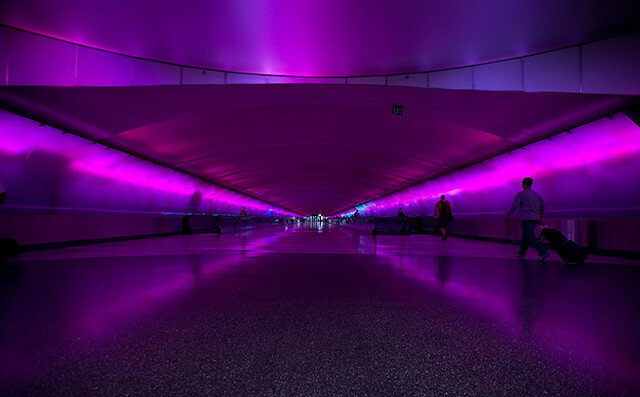 I’ve been through a lot of airports and Detroit by far is my favorite; for a lot of reasons, but mainly to color tunnel. It was well worth the effort. Futuristic.